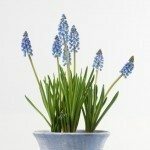 Growing hyacinth bulbs in tall vases into water, the flowers develop straight from the bulb, without stems, and the flower heads are runty, almost deformed. Very little scent. Advice please.